1 tbs natural sweetener agave, maple syrup, etc. In German markets there is a brand of bio vegan and vegetarian bread spreads which are incredibly delicious. Their vegan products are on sunflower base and recently with lupine. They have various types and flavours so I thought….. whether I could make them myself. Raw sunflower seeds are an excellent source of vitamins E and B1 and provide moderate amount of the vitamins B5 and B9. They also provide our bodies with the minerals manganese, magnesium, selenium, copper and phosphorus and they are rich in Omega 6 and 9 essential fatty acids. It is good to soak the seeds in water for 2-3 hours before making the spread. 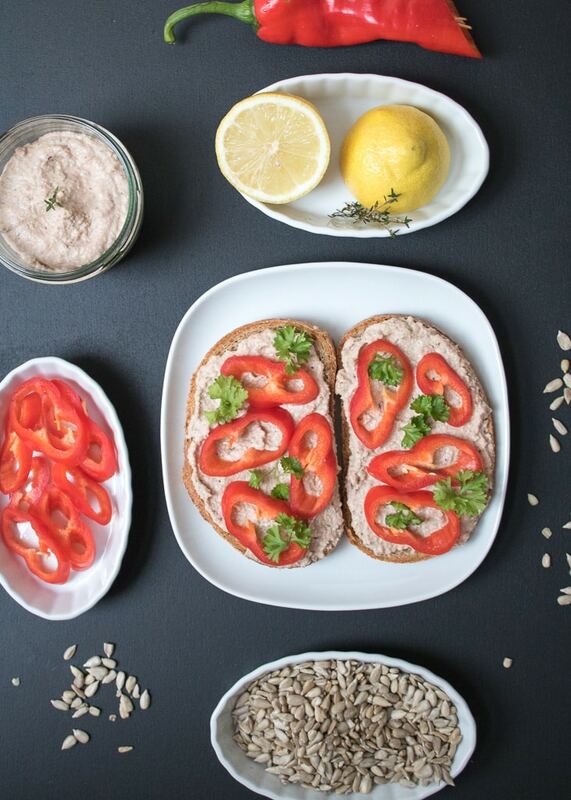 This spread can be flavoured with dried tomatoes, olives, roasted peppers and anything else that’s of your taste. I will be happy, if you share your results and ideas! 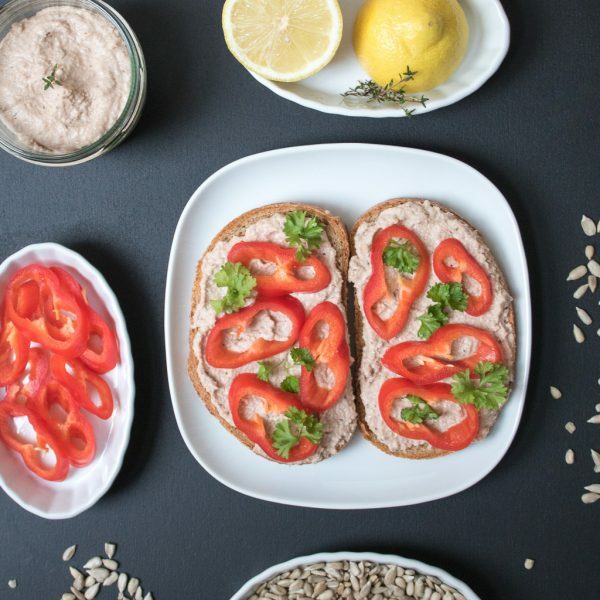 Vegan sunflower seed spread, so delicious and so easy to prepare. Garnish by your taste with dried tomatoes, roasted peppers, olives... or many more. Soak the sunflower seeds for at least 2 hours in water. Juice the half of a lemon. Put all ingredients in a blender or kitchen robot and strain until reaching a smooth mixture. Spread it on a loaf of bread and garnish by will. You can add few olives, sun-dried tomatoes or you favourite roasted veggi.